How many times have you been lifting and your grip starts to slips before your muscles fatigue? You don’t need to be an elite-level powerlifter to feel the frustration that comes from grip slip. The solution? Chalk. There are two basic types of chalk: powder chalk and liquid chalk. I’ll compare these different types of chalk below, but the focus of this article will be about choosing the best liquid chalk for lifting. 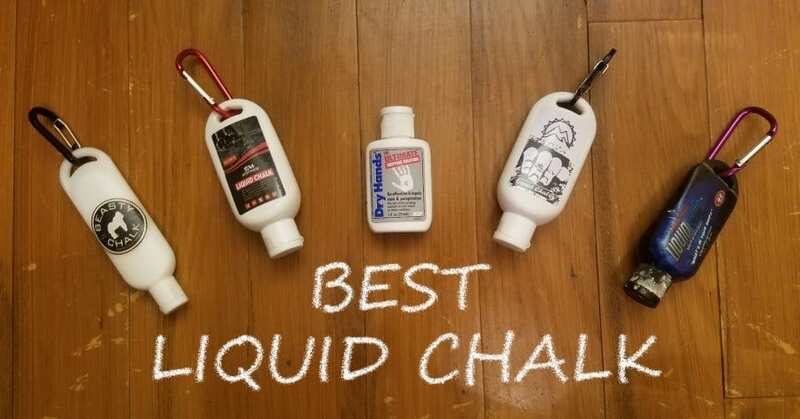 If you're in a hurry, I've included a summary of my rankings for the top liquid chalk chalk brands below--it's based on my personal experience using each one. I've got plenty more to discuss on the topic of liquid chalk. Plus, I'll be doing a detailed review of each of the five liquid chalk brands shown in the above chart. Use the table of contents below if you want to jump to a specific topic. Just as the name implies, liquid chalk is a fluid form of chalk. 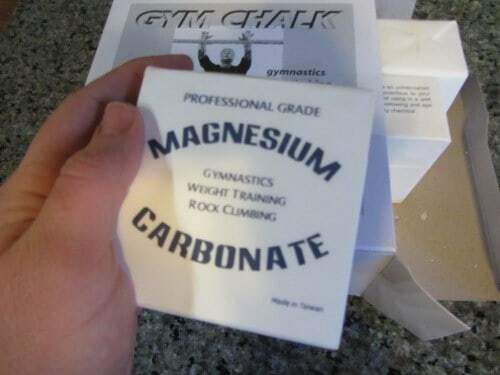 Liquid chalk is often made from the same material as powder chalk: magnesium carbonate, which has been shown to be most effective at doing away with perspiration and improving grip quality. While powder chalk is considered superior for performance due to better functionality, its negatives often outweigh its positives for many lifters. I’ll discuss the pros and cons of chalk powder compared to liquid chalk in the following section. 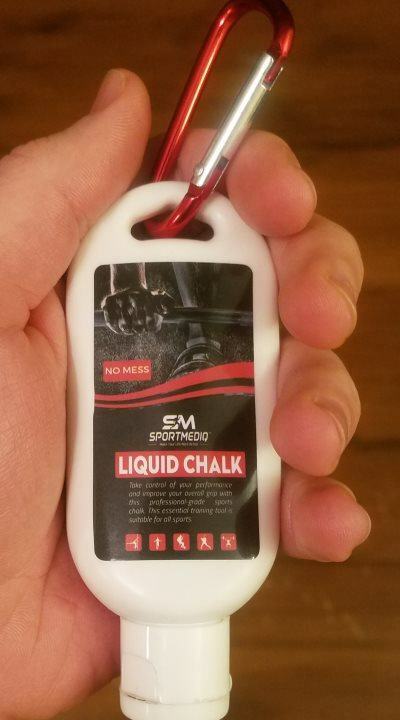 Liquid chalk is becoming more popular to use than the traditional chalk powder and there a few reasons for this: it’s more convenient, all gyms allow it and it’s less messy. However, powder chalk is still very popular due to its superior functionality. In fact, it’s the standard choice in some the serious strength-focused gyms, and also a favorite of most home gym lifters. Let’s breakdown the major differences between liquid chalk and chalk powder. If you’ve ever used traditional chalk powder before, you know only too well how it can quickly turn the room into a something that looks like a baby powder bottle exploded. Traditional chalk is plain messy. It can stain clothing and equipment. In the least, it leaves a bothersome residue. Liquid chalk offers almost no mess when used. You apply the liquid directly to your hands, rub them for a few seconds, and your grip is ready to go. No mess and no hassle. You might get a few smudges on your cloths if you rub your hands on them, but it won't be very noticeable and can easily be rubbed away. When it comes to superior functionality, traditional powder chalk has the upper hand. One application of powder chalk will easily take you through multiple sets, if not multiple exercises, depending on intensity, exercise type, and sweat amount. Traditional chalk offers a smooth and dry grip right from the start. Without the waiting around for it to dry, you may be more product, achieve more sets, and have an overall better workout. With that said, powder chalk can quickly become a nuisance depending on the environment you’re in. Powder chalk has an appropriate time and place. For example, if you are visiting a gym that specializes in Olympic-lifting and powerlifting than you’ll most likely see everyone using powder chalk. Taking a powder chalk block into your average commercial gym where you’re surrounded by people who have never even seen or used chalk before: this is not the time or place. As I’ll expand on below, many gym owners are banning the use of traditional powder chalk. This is where liquid chalk can save the day. Not only does it provide the grip improving benefits of traditional chalk but it does so without the mess, which could frustrate those around you. Traditional dry chalk may not be welcome in your local gym. Many gym owners have banned the use of chalk powder because they don’t want to get stuck cleaning up the mess or have other gym patrons have to deal with breathing in a chalk cloud. From a cost standpoint, chalk powder is a clear winner over liquid chalk. No question about it. You can buy a full 1 lb. of block chalk for about $10-15. When I consistently trained at home or in gyms that allowed powder chalk, this amount would easily last me 2+ years, and I probably use more than the average lifter. You can't beat the the price per application of powder chalk. Here's a pic of me holding one of eight blocks of chalk that comes in the the 1 lb. "Gym Chalk" box. Compare that to liquid chalk, which typically costs the same, but only lasts between 1-3 months, typically. I probably use more than the average lifter, due to my propensity for sweating--so others may be able stretch a bottle out to 4 or 5 months. Less is more: Unless you have giant hands, you probably need less than you might initially think. Let it dry completely before you decide if you need more. Apply evenly: Cover your entire palm and fingers. Be sure you don't miss the region around your thumb and forefinger, as well as across the middle of your palms where you grasp the barbell. Be patient: After you apply the liquid chalk, wait at least 15-30 seconds, or longer if needed, to let it dry. You know it has dried when your hands turn white. You’re going to need to reapply: Just like with powder chalk, you’ll need to re-apply liquid chalk at some point during the workout. When you’ll need to reapply will depend on a variety of factors including type of exercise (push vs. pull), amount of weight you’re using, and amount that you sweat. In general, you can expect to get through a few sets before needing more. Wipe it down: Be sure to take care and wipe down your hands and equipment once you’re finished. 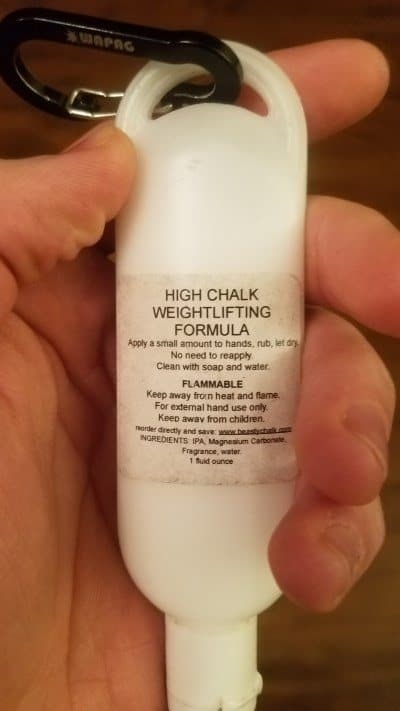 If you want to find the best liquid chalk for lifting then there are certain things you’ll want to look for when browsing. How well does the liquid chalk improve your grip? Are you able to firmly grip the barbell or dumbbell without slippage? Or do you immediately notice perspiration? Ideally, the grip should be completely dry and slightly sticky but not overwhelmingly sticky. How quickly does the liquid chalk dry? 20 to 30 seconds is the usual amount of time you should expect and you shouldn’t need a fan to dry your hands. How strong is the smell from the product? Liquid chalk is alcohol-based, so they will all have a temporary odor. The odor varies from product to product in terms of how strong it is, how long it lingers and whether or not other ingredients are added to cover up the chemical alcohol odor. In my opinion, the smell isn’t a huge deal unless, but it’s something to consider if you’re deciding between 2 otherwise similar products. The alcohol scent is basically non-existent in products that have added fragrances into their formula to cover it up, which most people enjoy, but others might find it unpleasant if they’re sensitive to artificial fragrances. How much do you need of the liquid chalk to have an effective grip? The average amount is 1½ dime-sized dollops. If you’re pouring out much more than that, something is wrong. How thick or runny is the chalk when you squeeze it out of the bottle onto your hands? Is it like pouring cement on your hands or like running water? It should be neither. While some runniness is okay, liquid chalk should have a thick consistency that doesn’t immediately spill down your hand. Also, it shouldn’t be so thick that it’s like rubbing liquid cement on your skin. How does the liquid chalk feel while you are applying and after it dries? Is it a gooey and sticky feeling like you just put Elmer’s glue on your hands? Does it feel more like rubbing in a hand cream or moisturizing lotion (maybe with a little added stickiness)? All else being equal, this is more desirable than an overwhelmingly gooey, sticky solution. After it dries, is it powdery like after you eat a powdered doughnut? Or does it feel smooth like baby powder? You want a feeling that is smooth like chalk but firm like dried paint. How long does the liquid chalk last within the first few minutes? Does it keep your hands dry and tactile through multiple sets? If you constantly have to reapply as frequently as ever set or every couple of sets, it’s not a great product. Does it keep your hands dry and tactile through multiple exercises? If it does, it’s a top-tier liquid chalk. Depending on the intensity of your workout, longevity can vary. How long can you stretch out the lifespan of the bottle? Just a couple weeks? That’s pretty bad. Or can you make it last a month or two? That’s better. Anything more than two months is excellent. Longevity of the bottle ties into short term longevity: the length of how long liquid chalk last will vary but a high-quality liquid chalk requires minimal repeated applications. The more frequently you need to reapply, the faster your bottle will run out. After testing all five products, Dry Hands is my clear choice for best liquid chalk brand. Produces by far the strongest, most tactile grip of all liquid chalk products tested. Requires the smallest amount per application, compared to all other products tested. 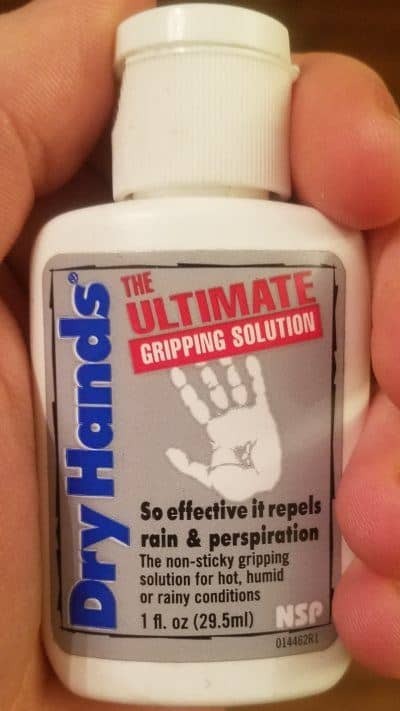 Ideal for those people who have extremely sweaty hands as it repels water from your grip regardless of whether it is sweat, condensation, or water from the environment (e.g., water fountain). Dry Hands is going to last much longer than most other liquid chalks. Dry Hands is going to last much longer than most other liquid chalks. No carabiner included. In fact, the bottle is not even designed with a hole where you could attach your own carabiner if you wanted to. I like to clip my liquid chalk container to my water bottle. 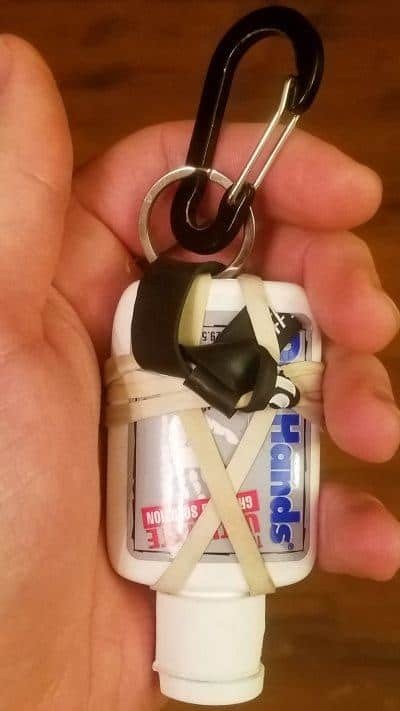 Since Dry Hands doesn't have a place for a clip, I wrapped a couple rubber bands around the bottle and attached my own carabiner as shown in this photo. It's sloppy, and I'm sure there's a much more elegant workaround, but it does the trick! Very High — Easily the best of all liquid chalks tested. Fast — Dries in just 10-15 seconds, in my experience. The bottle says 15-25 seconds, but I personally have never had to wait that long. Very Slight — Has a very slight odor from the alcohol-based solution. It is barely noticeable and dissipates rapidly. Very Small — Half of a dime-sized dollop. Low to Medium — It has semi-thick/semi-runny consistency; it will run slowly if you angle your hand. It is not so runny that it could accidentally spill off your hand (which is the case with Liquid Grip Liquid Chalk, discussed below). “Gooey” / Dry + Minimal Stickiness — Feels gooey when initially applied. After applied, it’s dry and grippy. It offers minimal stickiness and does not have a softness or smoothness feeling to it, which is ideal. High — It can easily last for multiple heavy sets without needing to be reapplied. In fact, I can often complete multiple exercises (each for multiple sets) consecutively without needing another application, though it depends on several factors (i.e. exercises, weight, sweat, etc.). High — The 1 oz. bottle lasts me approximately 3 months. This is longer than all other brands I've tested, some of which are larger than 1 oz. There is no carabiner included, and there is no hole on the bottle for conveniently attaching your own carabiner. However, there is a workaround--you can secure a rubber band around the bottle and then attach the carabiner to the band (see image above). If you want to have dry hands for your toughest sets or workouts, SportmediQ Liquid Chalk is the perfect runner-up to Dry Hands Liquid Chalk. An ideal liquid chalk for people with touch sensitivities or those who don’t like odd feelings of stickiness or residue on their hands – This goes on like a lotion then dries with a softer feel. Small application ensures a high longevity. Smooth yet thick consistency for ideal application. Easy to accidentally use more than necessary due to a medium drying time. It’s important to be patient with this one. May be difficult to reseal due to chalk crumbs so be careful with the bottle and be sure to wipe it down after each workout. High — Provides a strong grip, but it's a step down from that of Dry Hands (discussed above). Medium — Takes approx. 15-25 seconds to fully dry. It will seem like it's completely dry before it actually is. If you don’t wait long enough, you’ll think you need more than you actually do, and thus you'll end up going through the bottle faster than necessary. Very Slight — Only smells when you're applying it to your hands. Even then, you may not notice the smell unless you're rubbing it in close to your face. Small — Approx. 1 dime-sized dollop. Medium to High — It has a generally thick consistency. It is not runny, but I would say that it is "wetter" than other brands that also have a thicker consistency (e.g. Beasty and Mosher). Moisturizer Cream-like / Dry & Mildly Sticky — Feels almost like a moisturizer cream similar to Beasty Liquid Chalk (discussed below). However, compared to Beasty, it leaves a drier, less soft feel, which translates to better grip. That being said, it does have a softer feel than the Dry Hands Liquid Chalk (discussed above) and is somewhat less grippy. Lastly, SportsmediQ also has a mild stickiness to it; enough to help with grip, but not so much that it's uncomfortably sticky. Medium to High — It’s typically easy do go multiple sets without reapplying. But you're less likely to be able to go through multiple exercises (with multiple sets per exercise) without reapplying, unless you're using lighter weights and/or doing exercises that aren't very grip intensive. Medium to High — You can make it last for a while but the key is to not overuse it. It's easy to accidentally overuse it since its initial "feel" makes you think you need more than you actually do, per application. It leaves lots of chalk "crumbs" whenever opening the cap. It comes with a carabiner, which attaches on the end of the bottle, which you can then attach onto your water bottle, belt loop, etc. 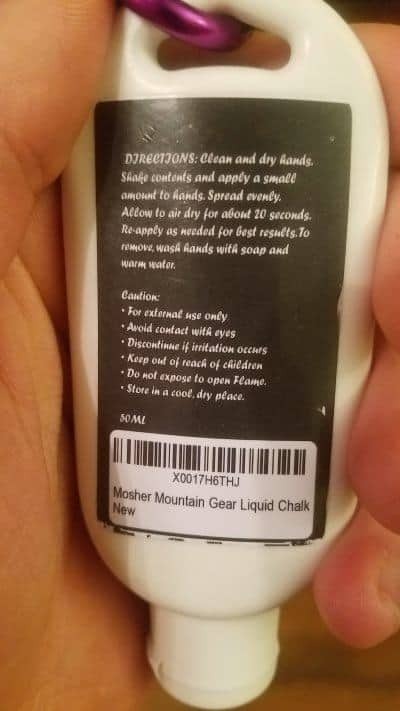 While I don’t think it lasts as long as Dry Hands, the Mosher Mountain Gear Liquid Chalk is definitely a top contender for the best liquid chalk for lifting. The viscosity is thick but not in a way that makes it difficult to spread across your hands. In fact, its thickness is what makes it perfect for applying an even coat across your palms and fingers. Impressive application longevity - You can easily make it through multiple sets. Hosts a dry-sticky grip, which many lifters prefer as they take it as a sign of reliability. The smell may be a bit much for some people. It’s one of those smells from grade school that you either loved or hated. If you’re a person who is sensitive to the smell of Elmer’s glue then you’ll appreciate the heads up. With that said, this shouldn’t be a reason not to buy it. Make sure to wipe down the container after every use; otherwise, you’ll have a build-up of chalk crumbs, making it difficult to close and re-open. High — The Mosher liquid chalk provides an impressively strong grip. The grip quality is neck-and-neck with the SportmediQ liquid chalk (discussed above). However, if I had to pick a winner from these two, I'd say Mosher provides slightly less grippiness. Medium — It takes about 15-25 seconds to completely dry. It's similar to SportmediQ in this way, and also in terms of needing to wait longer than you think for it to fully dry. If you don't wait long enough, you'll feel the need to apply more. Or if you grip onto something before the application has completely dried, you'll lose some of it on the bar/equipment handle, and your grip will be less effective. Glue-like — It smells a bit like Elmer’s glue. But don't worry, there's no actual glue in the product. Also, the glue-like scent is not intense, though, and is only temporary. Small to Medium — Approx. 1 ½ dime-sized dollops. High — It is very thick with no runniness. I’d compare it to “creamy” or “smooth” in terms of consistency. Moisturizer Cream-like / Sticky — It has a bit of the moisturizer cream-type feel, like the SportmediQ, but that’s overpowered by a mild “sticky” feel. Mosher provides a somewhat less dry and somewhat more sticky grip than SportmediQ, which I describe as feeling very dry and mildly sticky. Medium to High — It’s typically easy do go multiple sets without reapplying. However, it's less likely to last for multiple exercises without reapplying, unless you're performing relatively less grip-intensive exercises or using relatively lighter loads. Medium — Doesn’t run out fast but doesn’t last super long either. This is a middle of the road liquid chalk. Leaves chalk "crumbs" whenever opening cap if any residual is left around the opening from previous workout. The amount of crumbs is notably less than with the SportmediQ chalk (discussed above), but still worth mentioning. Has hole on end of bottom for hooking onto a clip or carabiner; carabiner IS included. Liquid Grip Liquid Chalk provides an excellent grip but this is overshadowed by how short-lived each application is. Still, not a bad buy if on-sale. I’m not sure if it’s due to the feel of the grip but I found this to have serious grip, at least initially. I wouldn’t say it’s better than Dry Hands, but it’s definitely close. 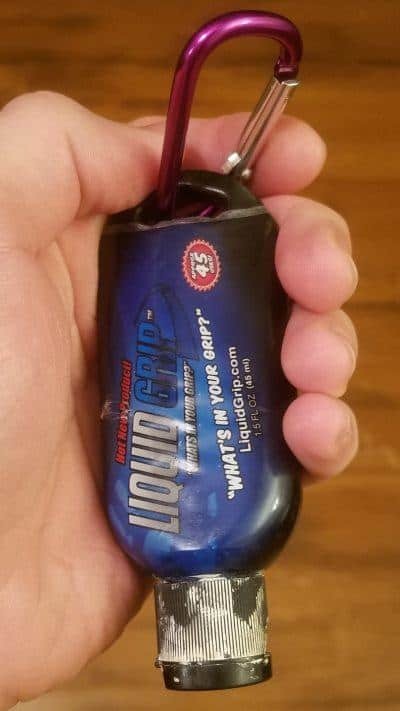 Unlike most of the others, Liquid Grip doesn’t leave any residue that needed to be wiped off the barbell or handle after use. Strong coconut smell that may be a pro or con depending on if you’re sensitive to added fragrances. Ideal for storage purposes - Won’t harden over time. It offers an incredible grip quality but unfortunately, it’s short lived. For serious lifters, this is going to be a big problem as constant re-application is needed. The drying time is slower than all of the other liquid chalks on this list so patience is a must. This liquid chalk is very runny making application messy and frustrating. This is also a reason for its low longevity as you slip and use more than needed. 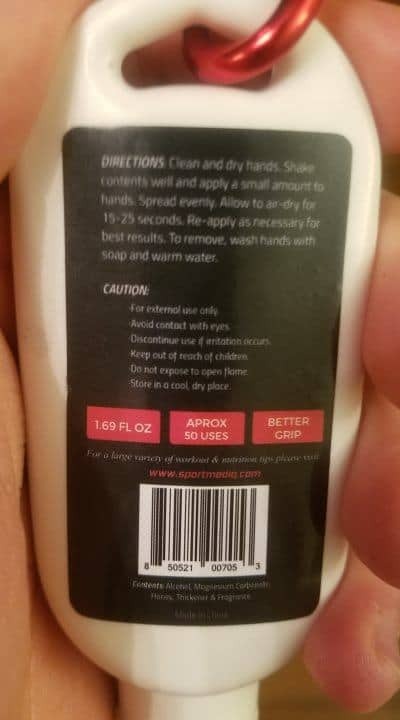 High — Possibly slightly more grip than Dry Hands (discussed above), but part of this may be because it has a “sticky” feel to it. Medium to High — Dries relatively slowly. It can take 20-30 seconds, sometimes longer depending on how much is applied. However, you can speed up the process by quite a bit by gently blowing onto your hands. That's what I typically do and recommend if you get this product. Strong but Pleasant — Has a strong coconut fragrance when being applied. I like it, but could see how some people might find it to be a bit much. Medium to High — Approx. 2 dime-sized dollops (technically not dollops, since it's such a runny liquid, but you get the idea). Very Low — The liquid is very runny. It could spill off your had if you're not careful and don't "cup" your palm to contain it before rubbing it in. Very Sticky — Although it's not unbearable, it's sticky to the point of being uncomfortable. Low to Medium — Each application is short lived. I found my self re-applying every couple of sets for most exercises. And I'd often apply a new coat after every single set for my heavier pulling movements. Though, I should note that when I reapplied very frequently, I was able to use a much smaller than amount than the "2 dime-sized dollops" mentioned previously in this table. Low — It runs out quicker than I would like for two reasons: higher than average amount needed per application; and it’s easier to apply an excessive amount accidentally because of its runny consistency, which makes it come out the bottle faster. It will stay preserved for months even with just a small amount left in the bottle, likely thanks to its low viscosity (runny consistency) compared to thicker liquid chalks that are more likely to dry up inside the bottle if close to empty and not used for several weeks to months. Has hole on end of bottom for hooking onto a clip or carabiner; carabiner IS included. High. Possibly slightly more grip than Dry Hands (above), but part of this may be because it has a “sticky” feel to it. 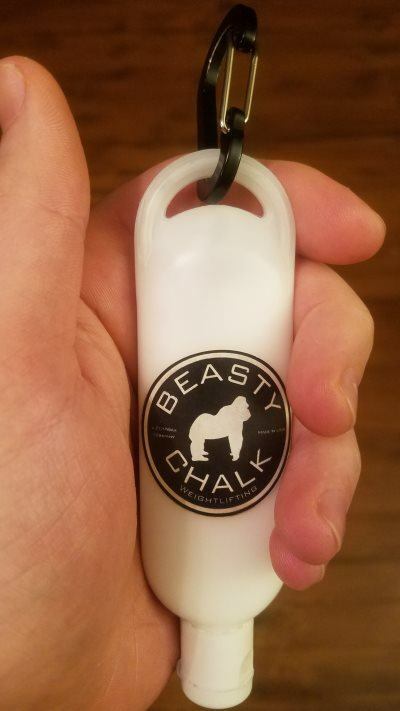 The Beasty Chalk (Gorilla Edition) Liquid Chalk is an 'okay' chalk overall. I initially had high hopes for it, but it's flaws became apparent after more extensive use. It will get the job done if it's your only option, but it wouldn't be my first choice. I’m not a fan of runny liquid chalk so I was really happy to see how thick this stuff was. It reminded me of suntan lotion but was easy to spread across my hands. This helped ensure that I covered my entire hand without a second guess. The smell of this liquid chalk really does make the difference. Instead of the unpleasant chemical smell that some brands have, Beasty Chalk has a bubble gum scent. The smell makes it friendly to be used in close quarters like a small weight room or yoga studio. You need a lot for one application - This liquid chalk requires the highest amount of application compared to all of the others. 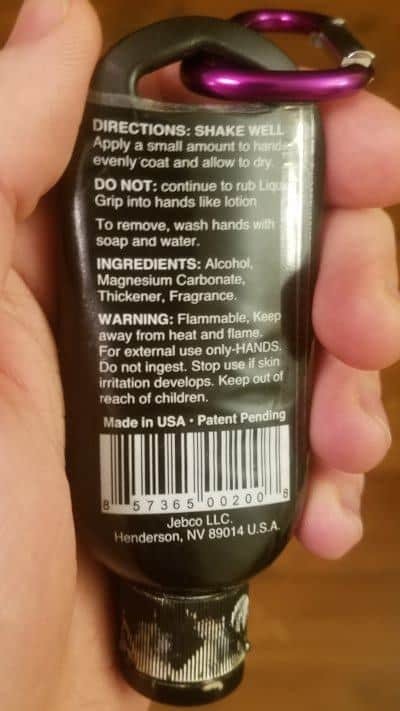 Thick application is cancelled out by how soft and smooth your hands feel after it dries. The feeling is too soft to be considered effective for lifting. The design of the bottle is awkward. You’re likely to lose patience and money as the bottle design gives you too much even with a weak squeeze. If you can master the technique to careful getting the liquid chalk from the bottle, you may really enjoy this one. For me, since the quality of the grip is so-so, I’d suggest investing elsewhere. Medium — It gives a better grip for sure, but nothing out of the ordinary; average. Medium — Drying typically takes 20-25 seconds to completely dry. This is typical among the ones I tested. Strong but Pleasant — It has a bubble gum smell. Medium to High — Approx. 2 dime-sized dollops. High — It is very thick, no runniness; “creamy” or “smooth” in terms of consistency. Moisturizer Cream-like / Very Smooth — Almost feels like a moisturizer cream when rubbing it in. Pleasant, but leaves too much of softness or smoothness, which feels like it detracts from the dryness and grip that it provides. It leaves a noticeably whiter coating on your hands after application, more so than others. Low to Medium – It often requires reapplying between sets. Gets backed up easily; likely to a combination of the bottle/bottle opening design and the thicker consistency--this is a recipe for accidentally shooting out a LOT of liquid chalk at once, and at a high/explosive velocity...especially as the bottle gets closer to empty. It actually shot out at me and went into my eye, which was a terrible experience; lots of burning and eye was irritated for 3-4 days after -- partially my fault, but the chalk and bottle design definitely played a role. Has hole on end of bottom for hooking onto a clip or carabiner; no clip/carabiner included. Beasty Liquid Chalk typically sells for around $13 for two bottles. When I bought it back in May of 2017, both bottles were 1 oz. However, it appears they have increased the volume by 50%, so now you get two 1.5 oz. bottes. So, for $13 you get 3 oz. of liquid chalk. Although I'm not a big fan of Beasty Chalk, the fact that you now get an extra ounce for the same price partially counteracts the negative of having a short duration. 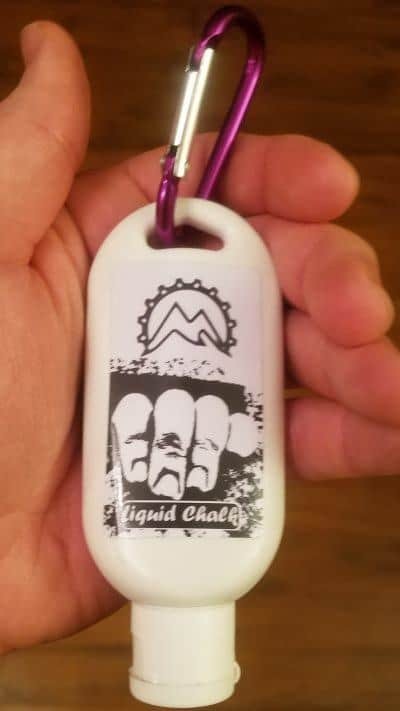 These five options are all great depending on your needs and budget but if there’s one brand that I believe is the best liquid chalk for lifting, it is Dry Hands Liquid Chalk. I would compare using Dry Hands to wearing a thin glove. Your grip dramatically improves as soon as it dries. Unless you are performing power lifting in a sauna, you don’t have to worry about constant re-application of the liquid chalk. This is going to save you time, hassle, and money. 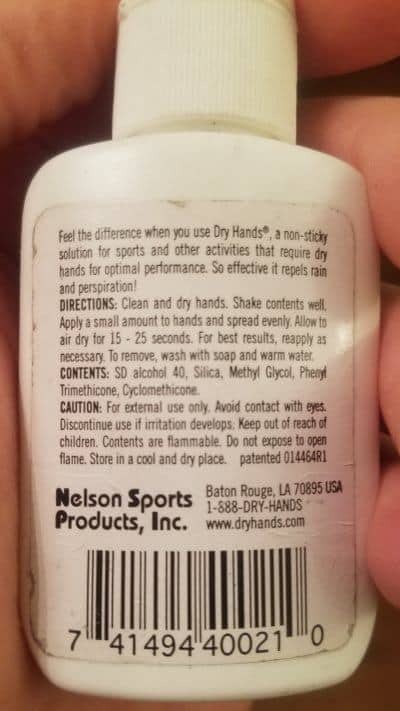 From my experience, Dry Hands is one of the quickest liquid chalks to dry and this is important if you’re trying to follow a specific set of acute variables in your workouts such as a 60-second rest break. Another great feature of Dry Hands is that when it dries, you’re not left with this weird residue that feels like wax or gel. Instead, you have a nice and dry powder-like feel without the powder. As far as how Dry Hands holds up during your average workout, I think it outperforms all other liquid chalks. Even during supersets or Olympic lifts, the stuff holds on for the ride. More intense workouts especially where you’re sweating more may require a second application but I doubt you’ll need it more than two or three small applications during a workout. If you want to ditch the chalk block, Dry Hands is the next step up.